Heard of the term “refashioning”? We met at the Handmade Movement Craft Fair earlier this year, and I quickly introduced myself and invited Agatha to join the Faire this year. It turns out that she was very interested as well! Since then, I noticed that Agatha had been conducting workshops at many places and events, and they were usually different and refreshing. I was looking forward to check out her workshops at the Singapore Mini Maker Faire this year. Check out my interview with Agatha below. It was my first face-to-face interview with a maker this year, and she has graciously invited me to her place. Agatha and her first refashioned item! 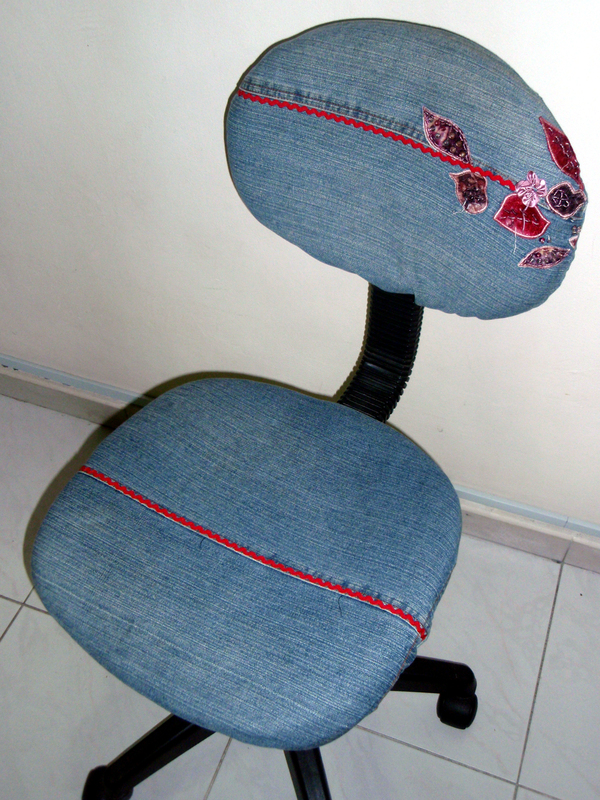 Using old jeans to make covers for this chair! 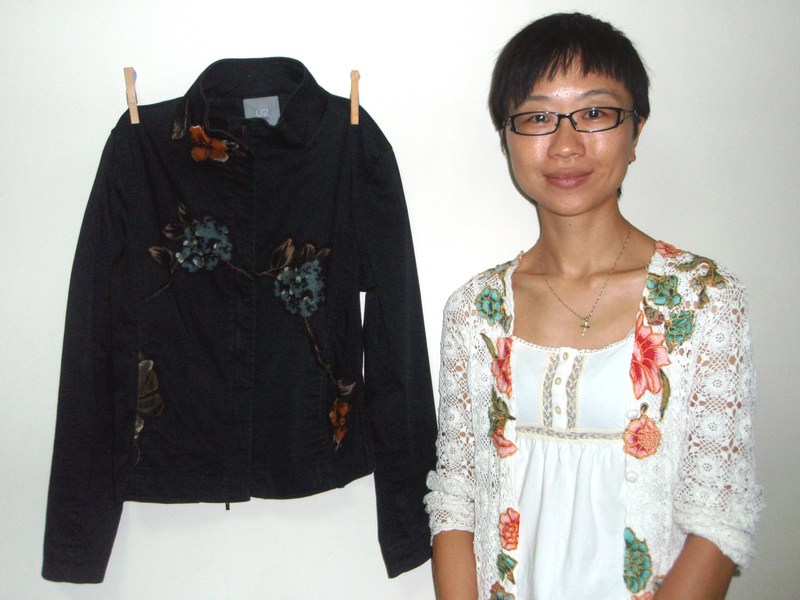 Besides refashioning, there are also several upcycling projects that Agatha did. Check out the photo of this chair with a jean cover (left) and a short video clip of her introduction of a refashion item that she was making when I visit. To read more, you can always check out Agatha’s blog here and Facebook page here. It seems like more and more people are using Pinterest as a source of inspiration. Agatha shared that she sometimes browse Pinterest too, though her inspiration also comes from window-shopping. Indeed, I get a lot of inspiration when I window-shop too. There are many good ideas on the street! During our interview, I shared with Agatha how I had not embarked on any sewing projects because while I have a sewing machine, I do not have a permanent place for it. Hence, I envied those who have a permanent place for it. Contrary to what I thought, Agatha advised me that sewing with a machine might not really make it easier. She highlighted that there are also issues such as maintenance (the machine might spoil if it is not oiled regularly), or if the parts are not cleaned properly. In fact, she found hand sewing more straightforward at times! If you are a fabric maker, what is your view and experience on this? Agatha also mentioned that she was encouraged by her friend to start a Facebook page less than a year ago when she started to run her first workshop, and since then she has 300 plus following. However, she was curious how interested people are in refashioning, especially when the responses to workshops are inconsistent. But Agatha is persevering in conducting her upcycling and refashioning workshop. In fact, during this upcoming Singapore Mini Maker Faire, Agatha has decided that on top of two workshops that she will run, she will also do a presentation on refashioning! For more information on Agatha’s workshops and presentation, check out the information on our schedule pages on the pre-registration procedures!